Who cares about window boxes? I learn perhaps one thing about gardening each year. (Go here if you’d like my favourite insight from back in 2010 about cut flowers in the garden). Here’s what I learned in 2012: window boxes matter. I’d never managed to keep them alive before this year. The lovely old stone front of our cottage is right on the pavement, since we have no front garden, but it offered only featureless windowsills to pedestrians, because I couldn’t stand the thought of returning to the dead pansies I remembered so guiltily from 2008. But it turns out I’m a new woman, because I was actually able to keep them alive all year – at planting time last December I incorporated a submerged water bottle that made it easier to keep them hydrated, but I also gave myself a memorable watering routine (“watering Wednesday”) that worked for me. I designed shade-loving, wind-tolerant planting for the north-facing aspect, and here’s what worked: a central small hebe as the feature plant, surrounded by lamium (dead nettle) with a silvery leaf, ivy and vinca minor (periwinkle). Those were my successful evergreens; I had to pull out a much-suffering fern, incidentally, which didn’t like the exposure of the position. 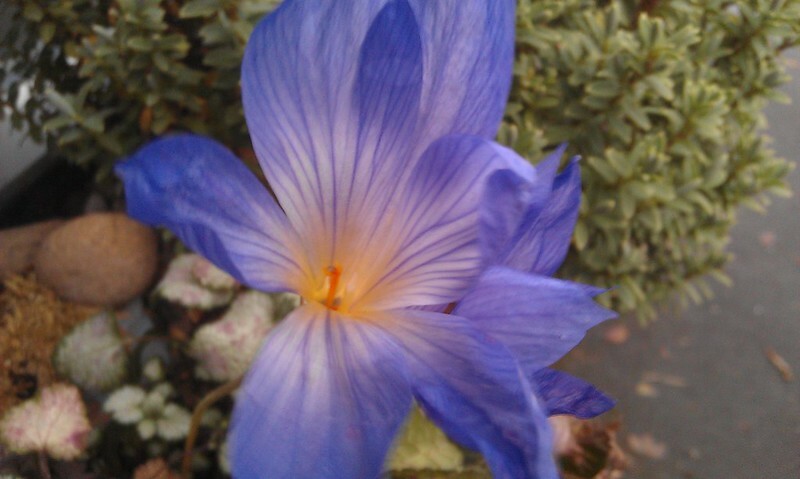 After the hostas had come and gone I put one forget-me-not plant into each window box; the foliage of this biennial, which I grew from seed, looks lovely and green now; the only colour in the window box at the moment is provided by the autumn crocus. 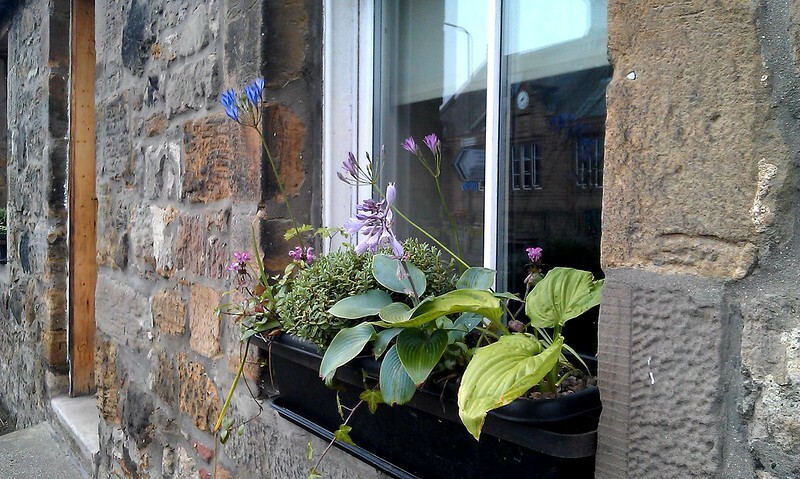 I can’t tell you how grateful I am for these simple window boxes. I pass by them every day, so many times a day. Even without the flamboyance of showy bedding plants like petunias, they bring that soul-nurturing life and greenness of the garden right up where I can see it, even when I can’t escape outside to get my hands dirty. What do you grow in your window boxes, or do you have another container that you couldn’t live without?